Anyone French could tell you that M was born Matthieu Chedid, the son of household-name singer Louis Chedid and the grandson of lauded Franco-Egyptian-Lebanese poet Andrée Chedid, a woman once described as ‘the voice of her generation’. 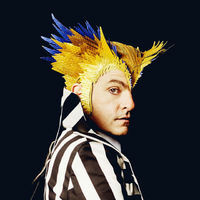 With his stage persona, his cartoon looking character and alter ego , -M- ,Chedid has invented a unique blend of funk soul rock and transformed French chanson into something completely new. -M- is an artist without parallel in France and - dare we say – in places beyond. An artist with the voice of an angel and a way with a riff that might have had Hendrix double taking; an artist whose live shows are the stuff of legend and whose multi-talent has bagged him a remarkable eight – eight! - French Grammys. He has just released his sixth album, “Il”, a new venture which explores the various textures of rock with a Frenchie je ne sais quoi, expect some Black keys with a disco ball sound, devastating guitar and basslines and –M-‘s usual sensual poetry. Writer: M. / Composers: Jérôme Goldet - M.
Writer: Andree Chedid - M. / Composers: Andree Chedid - M.